The capture of Beersheba (Be’er Sheva in modern Israel) was a turning point in the struggle between the British and Ottoman Empires in the Middle East in the First World War. The New Zealand Mounted Rifles Brigade played a key part in the capture of the town. Twice in 1917 the British-led Egyptian Expeditionary Force (EEF) had failed to take Gaza, the gateway to Palestine. 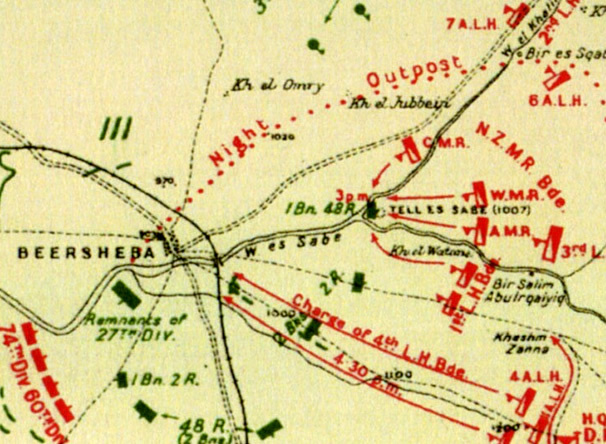 Its third attempt focused on Beersheba, on the eastern (inland) flank of the Ottomans’ defensive line. While three British infantry divisions attacked the main Ottoman defences on the outskirts of Beersheba, the Australian and Anzac Mounted Divisions rode in a wide arc to the east to attack the town from the rear. On the morning of 31 October 1917 men of the New Zealand Mounted Rifles Brigade attacked Tel el Saba, a fortified hill 3.2 kms north-east of Beersheba. After six hours of hard fighting the New Zealanders captured the hill. The way was now clear to attack Beersheba itself, but daylight would soon fade. In a daring action, the 4th Australian Light Horse Brigade charged in from the south-east with bayonets drawn, taking the Ottoman defenders by surprise. The town and its important wells were soon secured and the enemy retreated. By the end of the day at least eight New Zealanders had been killed and 26 wounded. The EEF now sought to trap the main Ottoman forces defending Gaza, but lack of water and skilful rearguard actions allowed most of the enemy troops to escape. Within a week, the Ottomans had abandoned Gaza. We have 19 biographies, 40 articles, related to Capture of Beersheba.